After a couple of weekends of Oakridge riding (MTB and X), The Logging Road Cyclist felt it was time to get out and do some exploring. He was drawn back to Rhododendron Ridge, with its high, isolated feeling and fantastic views. The fact that the R. Ridge trail was part of the old Skyline system gave the whole thing a nice historical feel. As usual, the Google helped to guide things. An MTB site pointed out that the Burnt Granite Trail might be used as part of a loop. Thus the plan was formed: park at the bottom of the 4670, up the 46 to the 6350 and Rhododendron Ridge, then further north to Burnt Granite and down the trail back to the start. Some more surfing informed TLRC that the Burnt Granite Trail was a haven for lots of cats, who liked to lurk in the dense rhodie forest, and further advised him Not To Go Alone. Along the way, TLRC encountered this site, which really opened his eyes to a lot of possibilities. TLRC, having spent a lot of time in the Klamaths, was vaguely familiar with Bigfoot lore, in particular the famous Bluff Cr. film, but he had no idea that there is a whole local scene. This discovery put the ride in a whole new light. The Burnt Granite- upper 4670 Rd. area is a nexus for Bigfoot. In 1967, a logger wandered off a work site and saw a Bigfoot family scrounging for food in the andesite talus up on Burnt Granite Mtn. 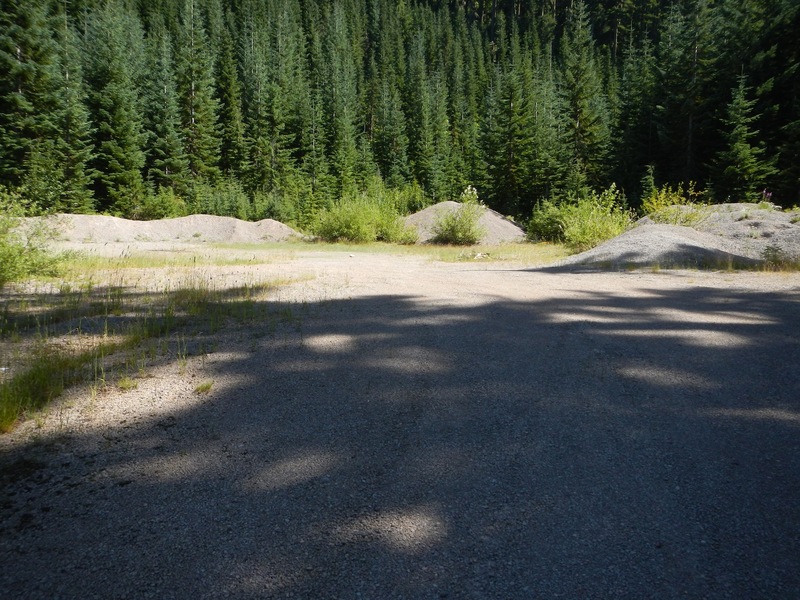 There is a big pit they dug, as well as piles of stacked rocks. 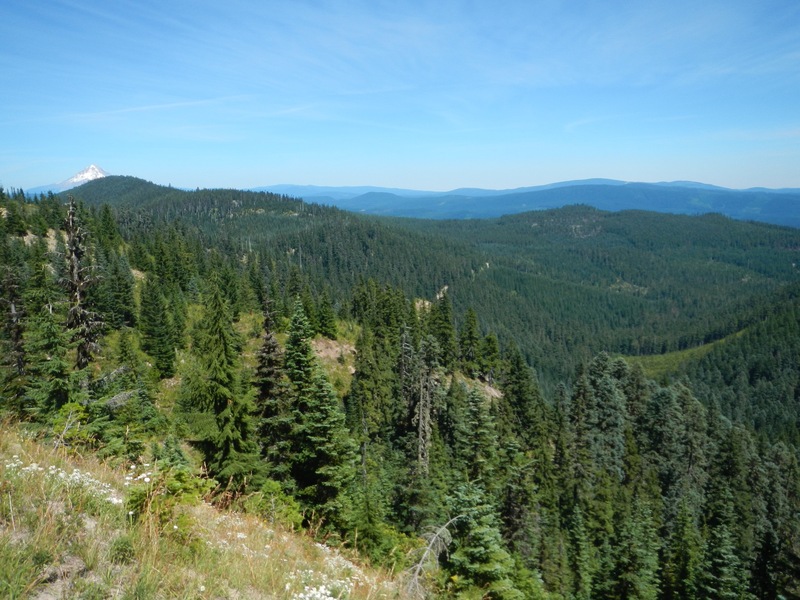 In 2005, while camped at a rock pit on the 4670, high up Lowe Cr., three men had two sightings, including one wherein BF stood over a restive camper, looking down into the pickup bed where said camper pretended to be asleep. Local geographic features suggest this is not the only Bigfoot spot: Ogre Cr., Tarzan Springs (where, in the 1920’s it was reported that an old man was living “with a band of ape men”), Devil Lake. More advice is given: this is not an area to travel in lightly: it is remote with rough roads, traveled by “armed and unpleasant” people (as opposed, TLRC mused, to “armed and excessively polite” people). First cats, now this. TLRC felt a frisson of disquiet. His plan decreed that he pass through the exact center of Bigfoot ground zero. This could be a real adventure, if all turned out well. 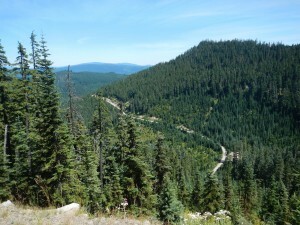 Thus, a bright cool morning found TLRC spinning up the scenic 46 road towards the Breitenbush-Clackamas divide. Up ahead, he saw another cyclist, going slow and hauling an odd looking trailer. Pulling up, TLRC encountered a pleasant young Frenchman. 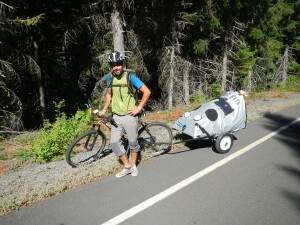 This man was pedaling from BC down to the Burning Man Festival, and was not taking the easy way. He’d come over White Pass up by Rainier, then up again over the shoulder of Mt. Hood to Timothy Lake, bound for Detroit and Bend. While stopping to pick cherries up in the Methow, someone had backed over his bike trailer and wrecked it, so he bought a frame for a small trailer intended for a car, and built it up for the rest of his trip. He said it weighed 130lbs loaded, hence the low speed. TLRC was overwhelmed by this display of sheer grit and toughness, and it took him a while to recollect his manners. “My name is Damien” the cyclist replied, shaking TLRC’s hand. O-M-G, thought TLRC. All this Bigfoot stuff, Devil Lake, and now this? Feigning a sneeze, TLRC dropped Damien’s hand like a hot coal, and turning, made a discreet sign of the cross, which settled his nerves enough so that he could remain with Damien for a polite interval before pleading that he had some ground to cover, and had better be off at his unladen speed. Damien, en route to Burning Man, with a heavy load. 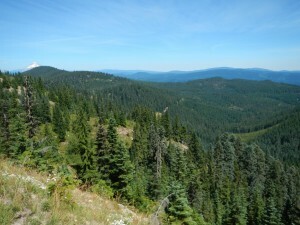 It’s 16 miles of moderate climbing from the 4670 to the start of the Rhododendron Ridge Trail. TLRC found himself enjoying the Trail more than the last time, even with the thought of large fanged cats hiding beneath all the rhodies, salivating at the thought of a TLRC canapé. TLRC whistled his way along the trail, the better not to surprise them, and tried not to let the serene, sun-dappled forest become in his mind a sombre dark thicket, pierced by fearsome shafts of unbearable summer sunlight, serving only to blind him to what might crouch ahead. Bye and bye, he reached Graham Pass, and set out along this new section of the Trail, here a trace gouged out of the second growth, paralleling the road. After a few hundred yards, TLRC took the easier path, and stuck to the road. He was unable to find the Trail again, until it appeared in a mile or so, at which point TLRC lacked the fortitude for more uphill trail punishment. He stuck to the road, and headed for Burnt Granite. Along the way to the next trailhead, the road passes above the site of the 2005 Bigfoot encounters, giving a box-seat view of the scene. The 4670 swinging into Lowe Cr. The rock pit where the 2005 BF encounters occurred is at the bend on the right side of the photograph. View NNE past Burnt Granite to Mt. Hood. The 1967 BF encounter occurred at the end of the ridge closest to the camera. Tarzan Springs lies near the 4670 at the base of that ridge. Sliding past Tarzan Springs, TLRC pondered mounting a search for the Burnt Granite Trail, which might be accessible from there, but it was just too easy to coast. To cap off all this excitement, the bottom 5 miles or so of the 4670 is simply beautiful single lane pavement, and provides a nice rush to end an exciting ride. Thank you for this article so beautifully written, it was a real pleasure to meet you in these difficult but beautiful times of climb, people like you are always a breath of fresh air on the roads to the unexpected. We go out into the woods seeking separate selves and what do we find?